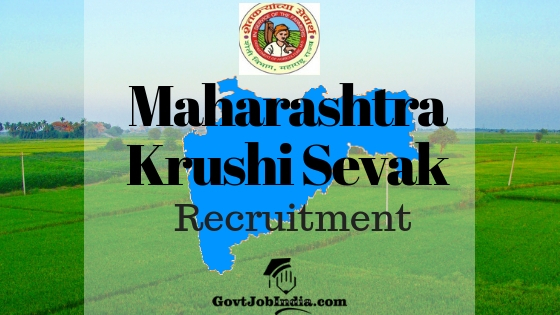 Maharashtra Krushi Sevak कृषि विभाग भर्ती – The Maharashtra Agriculture Department is inviting applicants for their latest Maha Krushi recruitment notification for the posts of Krushi Sevak throughout the state. The vacancy is spread out throughout the state of Maharashtra in districts Amravati, Aurangabad, Kolhapur, Latur, Nagpur, Nashik, Pune, Thane. All those who wish to apply for the recruitment can apply online according to their district by going through the official pdf of the district which we have linked below. This article contains the details of the Maharashtra Krushi Vibhag Mega Bharti 2019. The Krushi Sevak Mega Bharti is an amazing opportunity for all those who all those who wish to secure an agriculture related job in the govt of Maharashtra. The information has been given on the MahaPariksha website and you can find all the details of the same on the official website of the Maha Agri website which is www.krishi.maharashtra.gov.in. The last date to apply online for this recruitment is 25th January 2019, and candidates are urged not to waste this amazing chance to secure this govt job in Maharashtra. So, in conclusion, we are bringing you all the details of the recruitment like the Agriculture Dept Recruitment Application fee, and eligibility details. We have also given the direct link to apply for each of the districts. Now, Let us move onto the recruitment table. Candidates please note the Krushi Sevak Salary will be according to the notification. Candidates can view the Krushi Sevak Pay Scale by going to the official PDF. The various details required for a smooth application procedure for the MahaKrushi Sevak Recruitment are given below. Candidates need to read through the instructions before applying for the post. Applicants First name, Middle name, Last name, Fathers name, Mothers name, DOB, mobile number, photograph, signature are the bare details which you will have to enter onto your form. In “add your address”, you will have to select your type of address i.e permanent, correspondence or both and accordingly you have to fill your address details in the village, post office, state, district, pin code etc. Next, you have to click on Additional User details and enter your caste details. Applicants will be requested to submit their caste certificate. How to Apply Online for Maharashtra Krushi Sevak Recruitment 2019? In the “educational qualification” field, candidates have to enter his/her educational details. Examination details like graduation place and marks obtained, maximum marks, year of passing, University name etc should be entered. The percentage scored by the candidate will be calculated by the system. After this, you have to click on the “CONTINUE” button upon which confirmation will be requested. If the candidate is ST-PESA, then details like district, taluka, village need to be provided. You will now have to make an online payment in order to go through the registration. Click on the submit option which is made available. Hope you found this article about the Maha Krushi Sevak Bharti 2019 useful. If you did, make sure to share it with all those who might be looking out for such an amazing vacancy. Comment below if you have any doubts related to the same and we will clear it out as soon as possible. So, in conclusion, subscribe to our website @GovtJobIndia.com and also bookmark our page for latest updates.